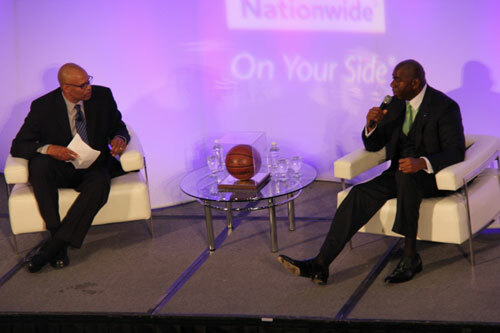 COLUMBUS, OH — Basketball legend and successful entrepreneur, Magic Johnson, spoke at the 2013 Black Enterprise Entrepreneurs Conference & Expo on Wednesday, May 15, offering business strategy and advice to minorities looking to become successful entrepreneurs.The event was held at the Greater Columbus Convention Center in Columbus, Ohio and sponsored and hosted by National Mutual Insurance CO. Successful entrepreneur, Magic Johnson, speaks with former Indiana Pacer basketball star and current TV sports analyst Clark Kellogg in an interview discussing ways to turn a business into a success. During his career, Magic achieved five NBA championships and three Most Valuable Player Awards. In 1994 he began his first year as the Lakers’ Vice President. In 1996 he was voted one of the 50 Greatest Players of All Time by the NBA, and in 2002, he was inducted into the Basketball Hall of Fame. ESPN’s Sports Century ranked Johnson #17 in their 50 Greatest Athletes of the 20th Century. In 2006, ESPN rated Johnson the greatest point guard of all time. Johnson, who recently became one of the owners of Los Angeles Dodgers, is worth over $600 million. Among his successful ventures include a chain of movie theaters, 17 radio stations, a foodservice and facilities-management company, the new television network Aspire and successful real estate ventures. Sports Speakers 360 is a sports talent agency for booking athletes. If you would like to book basketball speakers or NBA stars like Magic Johnson or Clark Kellogg for a speaking engagement, autograph signing, VIP meet and greet, charity fundraiser, guest appearance, product endorsement, social media campaign or special corporate event, you can request Magic Johnson speaker & Magic Johnson agent info or call 855.303.5450.